post-title May, 9th – Victory Day! May, 9th – Victory Day! Sharing the program of festive events, published on the portal of the NGS. On May, 9th at 8:00 the motocross “Roads of War” organized by the club “Moto-brotherhood” starts from the Circus. Anyone can ride in the column, the gathering of bikers is scheduled for 7:40. At 10:00 on Lenin Square the parade of troops of the Siberian garrison will start – this year more than 1700 servicemen and 40 war machines will take part in it. At 10:45 the column of the “Immortal Regiment” will marchm, starting from the building of the business center on the October highway, 3. The Banner of Victory and photographs of the heroes of the war will be carried along the highway, Krasniy prospect and to the Officers’ House (Krasny Prospekt, 63). From 12:00 to 19:00, an interactive program is organized in honor of the Victory Day in Pervomaysky Square. At 12:30 a solemn gathering will take place with the laying of wreaths at the Eternal Flame on the Monument of Glory. From 13:30 to 17:30 72nd city track and field athletics run in the name of Pokryshkin will be carried on Krasniy Prospect (from Deputatskaya to Sibrevkoma). The cinema “Pobeda” will show Soviet films about the war along the day. Territory of Victory, the exposition of about one hundred photographs of Soviet photo correspondents will also be held there. From 15:00 to 18:00 on the territory of the 17th military garrison of Oktyabrsky district, the reenactors will recreate an important moment of the Battle of Stalingrad. The audience will see the storming of the building in the center of the city using pyrotechnics and mock-ups of weapons of that time. 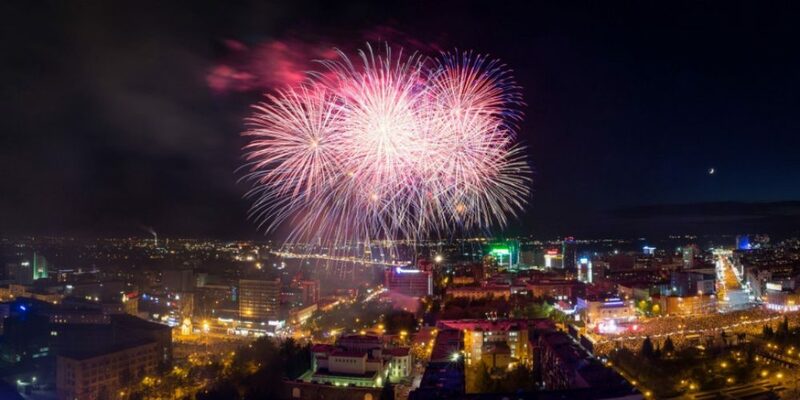 From 18:00 to 21:50 on Lenin Square there will be a festive program, and after it, the five fireworks will be launched into the sky at once.